Part of the National Black Theatre's 48th season, "In Pursuit of Black Joy"
Maechi Aharanwa in Sweet. Photo by Peter Cooper. BOTTOM LINE: A crowd-pleasing play tells the story of a love triangle set in late 1960s Kansas. Retha Baker, played to perfection by Maechi Aharanwa, enters the stage in silhouette and transports us to a small town in Kansas in June of 1968. So begins Harrison David Rivers’ new play Sweet, currently running as part of the National Black Theatre’s 48th season. Sweet follows the story of Retha, her younger half-sister Nina (Renika Williams), and the boy-who-got-away George (Tré Davis), who has finally returned home after graduating with honors from Columbia. The play takes place in the Bakers' dusty front porch, where the sisters hang and fold "other people’s clothes." The sisters have just lost their mother and are faced with the question of what’s next for them; where will life take them now that they are grown and orphaned? Matt McAdon’s set is a mess of clotheslines, from which sheets, posters, sunflowers and shirts hang all around. The beauty of the set is in its motion—every time George enters or exists the stage, he ruffles the lines and creates a stir. So, too, he disrupts the Baker sisters' lives. Very soon, we get the sense that, as Mama would have said, George is nothing but trouble. Director Raelle Myrick-Hodges brings us into the world of those living outside of the "action" of the late ‘60s. Rivers offers a glimpse into different kinds of radicalisms, less obvious ones, far away from protests, sit-ins and Dr. King’s speeches. Through Retha and Nina’s tugs-of-war and enduring sisterhood, Rivers paints a picture of the bravery required to stand up for those you love, and for choosing love. Throughout the play, Retha, Nina and George must face their longing for something else, something more, and answer the question of whether they will stay home or go away. They are challenged with opportunities—new job offers, new homes, no more familial obligations. As they go through the superbly intimate scenes Myrick-Hodge has skillfully directed, I was constantly wondering not only what each character would choose, but whether these choices would bring them the happiness they deserve. Rivers has us struggling with the question of what "going away" means and if it’s always the right choice. For Retha, going away was seldom an option. Her staunch resolve to always stay near her sister and follow her late mother’s rule that "nothing can come between sisters" has kept her here, folding laundry and dreaming of snowflakes. George, who has just barely set his suitcase down, is faced with the option of going to Chicago and accepting a job as a reporter. "Away" for George means officially turning his back on his small hometown, and those who still live in it. It also means taking the risk of not meeting everyone’s expectations—including his own—that he’s going to be a great writer one day. For Nina, her concept of "away" changes from the first to the second act. She begins with dreams of being taken away by a husband who would sweep her off her feet, but as she reminds us, sometimes when you get what you want, you lose yourself. Aharanwa is a superb performer—the freedom of her movements and the specificity of her emotional choices has the audience mesmerized. 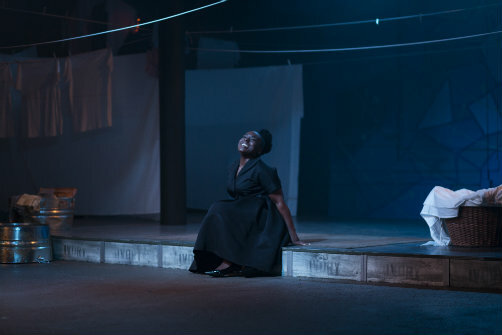 As Retha commands her space with gentleness and grace, we also see her smile through tears and embody the longing that is at the center of the play. Davis is a thoughtful actor with the charisma and charm required for George, and Williams’ Nina goes from a bubbly teenager in the first act to a more somber young adult in the second. Watching these three characters waltz in a cloud of dust between memories and fantasies is an absolute joy. As its title indicates, Rivers’ play has a sweetness that offers real respite from the current socio-economic climate, though the play is not without its own heartbreaks and surprises. Sweet is by Harrison David Rivers. Directed by Raelle Myrick-Hodge. Set Design is by Matt McAdon. Lighting Design is by Xavier Pierce. Sound Design is by Justin Hicks. Costume Design is by Ari Fulton. Stage Manager is Belynda Hardin. The cast is Maechi Aharanwa, Tré Davis and Renika Williams.